Our Christmas tree is up and decorated! We just need to find the right tree topper. My fiancé and I looked for a simple star tree topper and couldn't find one anywhere. It seems like fairies, angels and Santa Claus are the most popular toppers this year. Boo hoo! I'll just have to update you guys when I find the right one. 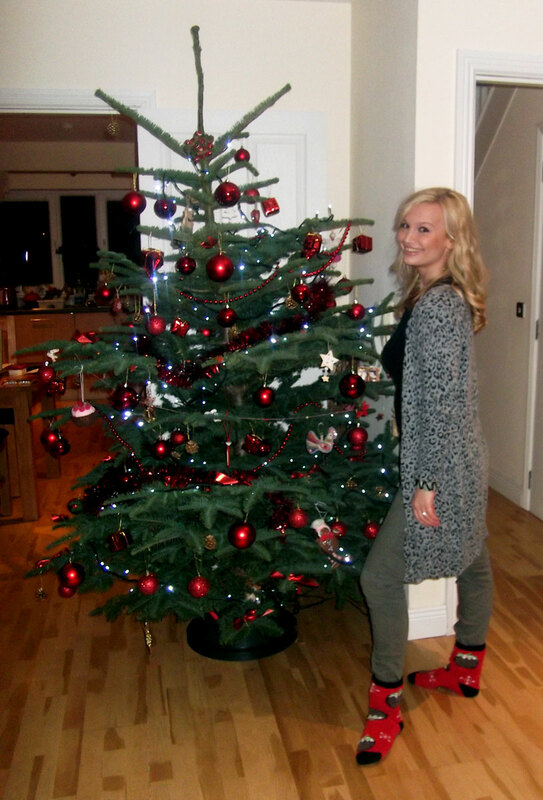 In the meantime, don't I look snazzy in my Christmas slipper socks?! Again, as you can see I'm very proud of our tree. We purchased a huge box of decorations and 250 white LED lights today from a Christmas shop in Douglas Court, to which we added our own personal decorations which are bits and pieces we've collected over the last two-three years. Let's hope Albi doesn't pee at the tree or steal any of the decorations! Have you put up/decorated your Christmas tree yet? It looks lovely, Anna...and so do you posing with it! Love the red colors...it's the perfect red! I will miss not having a real one with that lovely pine smell this year, maybe I'll just spray some pine freshener! LOL! Enjoy it and your adorable Christmas slipper socks! @pam i like the tshirt idea! I love your hair when you put it half up, but you've never done a tutorial for it. Do you think you could do a quick tutorial about it on youtube soon? Haha, I don't think Rugby will pee on the tree because it's fake but we can't put a tree skirt on it because it pulls it apart and eats it... Looks great and so do you!! Beautiful decoration and socks!!! I'm going with gold mix with a little red the difference? my tree is plastic =( it's a tree anyway. @Sarah Thank you for the tip! Love stars at Christmas time! @alongcameaspydr Thank you! That is a wonderful idea! @lake breeze I love your tree too! @Natasha Oh, thank you so much! There's a B&Q near where I live, I will check it out! @Pam Wonderful ideas, thank you! I had actually thought of most of those except for the leather gloves, you're very good at this! @Anonymous Which style do you mean? Like the Brigitte Bardot tutorial? @Shopperita Ooh a snowflake, that sounds pretty! @Soterranea Thank you! I'm sure your tree will be beautiful, red and gold are so pretty together! cupcake ornaments? super cute! where'd you get those?